Let’s face it — getting kids to eat their vegetables is not for the faint of heart. As parents, most of us have battled it out with our little ones – begging, pleading, and trying to convince them that broccoli and kale are truly delicious! Sometimes we have to go about this differently, and sneak those veggies into smoothies with enough fruit to be sweet, yet enough greens to be filling and delicious. I’ve compiled some easy smoothie recipes for kids that I think will satisfy your picky eater. As adults, we already understand and appreciate the health benefits of green smoothies, and translating that appreciation to our kids is a great way to start healthy smoothie habits for life! When kids see handfuls of greens going into the blender, and when they see how yummy and delicious they taste, you’ll know you’re on the right track to smoothie success! Smoothies are a great way to introduce new flavors and textures to kids. I remember that my son was fascinated with the different ingredients I put into the blender, and allowing him to help me blend it all up made him part of the process and more inclined to taste the healthy concoctions. Smoothies really fit the bill for those days when we were in a hurry to get out the door! Instead of grabbing a packaged breakfast loaded with sugar and white flour, I would blend up a smoothie and pour it into his cup, making a great fuel-filled breakfast. If he was still hungry, I would give him a whole-grain fig bar, a slice of sprouted grain bread, or something healthy and sustaining. Overnight trips can be a challenge as well, because you can’t just shake up a smoothie in a shaker bottle. It comes out watery and of course nothing blends! I purchased a small, travel blender, which was a life-saver, and packed a small cooler with ice packs and frozen fruit. I would also portion out my greens into small baggies, and keep those frozen as well. I had enough ingredients for 2 or 3 smoothies while we were traveling, which was a great way to stay healthy, and avoid all the fast food stops along the way. The thing I love about smoothies for kids is that I never had to give my son any vitamins. I was always concerned about the additives in vitamins, and the amount of time it would take for the vitamin to break down, if at all. So I started using the Vega Protein Shake Mix, which is plant-protein, and remain convinced that this is the way to go. The protein shake mix, along with the organic, fresh ingredients, means that those little bodies will get exactly what they need from real food, along with healthy fats, protein and fiber. You won’t find that trio in any multivitamin. My son learned so much about eating healthy when he was helping me prepare daily smoothies. Today, he is 22 years old, and not only buys his own organic greens, but makes his own smoothies, and knows which ingredient blends best with which. I think that kids, for the most part, love to learn the names of the different fruits and veggies, and love to touch and feel all the different textures, colors and sizes, which is a great way to teach them about nutrition. Then, once they feel comfortable in the kitchen, they are more inclined to consume what they have helped prepare. A chocolate or apple-pie flavored smoothie will taste like dessert, and what kid won’t want to try that? The recipes included here are sweet, but without added sugar, and densely packed with nutrients from fruits and veggies. They are made without any caffeine or spicy ingredients like cayenne pepper. They have been sourced from GreenBlender.com, which is the company that delivers my smoothie ingredients right to my door. Yes! A smoothie delivery service! Each week, I receive pre-portioned ingredients to make my smoothies at home. I get to choose 5 smoothie favorites from a selection of 8, and then I receive all the ingredients to make 5 different recipes, with 2 servings in each recipe. Takes the guesswork and mess-work right off the table! Blueberries have more antioxidants per serving than almost any other fruit and are one of the healthiest berries you can eat. Combine with bananas and oats to make a powerful breakfast meal replacement that will keep you and your kids energized and full for hours. Add some powdered plant protein as a substitute for the oats, and you’re good to go! Need some ice cream satisfaction? Try this smoothie. Completely plant-based with no sugar added. Lucuma is a Peruvian fruit that is ground up into a powder, and when paired with the the sweet cacao powder, has a nice caramel taste. Freeze the banana first for some extra creamy smoothie goodness. The dark color of blackberries means that they have the highest amount of antioxidants — similar to blueberries — when compared to all other fruits. Blackberries keep your brain sharp and your skin tighter. Kale, the original superfood, has tons of vitamins C, K, A, and folate, also good for a healthy brain. Plant-based protein is packed with amino acids and organic compounds to keep you and your kids in tip-top shape all day. This smoothie is chock-full of beta-carotene, vitamin C and fiber. Carrots add some sweetness along with the potassium-rich banana, and cinnamon is a natural anti-inflammatory which regulates blood sugar. Walnuts provide some Omega-3 brain food, and top it all off with some unsweetened coconut flakes. Give your kids some carrot cake without any of the refined sugar and flour! Your kids will be wide-eyed when they find out that they are having a cookies and cream smoothie for lunch! Again, lucuma powder, from the Peruvian Lucuma plant is a low glycemic sweetener with a unique caramel flavor. TIP: Wait until the pears are extra ripe for extra sweetness. (Nutrition Facts: 136 calories, 4g fat, 15g sugar, 5g fiber, 3g protein, 22g carbs per 12-ounce serving. Yields 2 servings). Lucuma powder again! Your kids will love this caramel-apple smoothie, loaded with potassium, calcium, magnesium and phosphorus. A childhood classic and you’ll love it too. Camu-camu has more vitamin C than almost any other food on earth, and has 10 x more vitamin C than one orange! Start your kids’ day with this orange smoothie burst and keep those colds away! Nutrition Facts: 173 calories, 8g fat, 4g fiber, 3g protein, 17g sugar, 18g carbs per 12-ounce serving. Yields 2 servings. Easy and delicious. Is there anything more to say? TIP: Use frozen bananas for extra thick creaminess. A comfort-food for your kids. Swiss chard has a very subtle, earthy flavor which balances well with the sweet apples. Regulate blood sugar levels with cinnamon and the quinoa flakes add iron, B-vitamins, calcium and fiber. Heart and brain healthy walnuts add additional protein! Nutrition Facts: 222 calories, 10g fat, 15g sugar, 6g protein, 13g fiber, 36g carbs per 12-ounce serving. Rhubarb? It’s not as scary as it sounds. Rhubarb is a great source of vitamin K, for brain health, bone growth and repair. Strawberries are an anti-oxidant, and the cashews, banana and Lucuma powder add a great creamy consistency to the smoothie. I think you’ll see that these easy smoothie recipes for kids will transform them into veggie lovers, and they won’t even realize it! 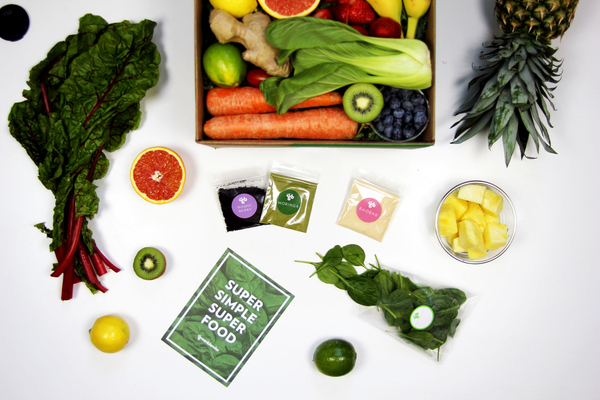 Make your life even easier and click below to get smoothie ingredients delivered right to your door! Wow you have so many smoothies one on page! This will be so useful for me. I do a green smoothie breakfast for my kids every morning, to help them detox, for their bad eczema. It seems to be helping. I’m going to use your smoothie recipes for other times of the day! So excited! Thanks, Joo…! So happy you like the recipes! The important thing is to add the plant-based protein, which makes the smoothie into a meal. So delicious! What do you put into your green smoothie? I can’t wait to try out the orange Burst recipe on my nephews. Some days the best you can get them to eat is a few olives and some orange slices. They fill up on a ton of chips and cheese (nachos to the rest of us). Their mom isn’t a fan of forcing her kids to eat anything if they don’t want to. Maybe some of your wonderful recipes will get them to want to. It’s not good to force-feed kids — that’s for sure, but drinking smoothies is a great way to expand their palette and try new, delicious fruits and veggies! Thanks for writing! Wow, so many delicious smoothie recipes! I love them and have one a day. I am not very creative, so this gives me a LOT of choices! These are definitely not just for kids 🙂 Thanks for sharing! I love them! So glad you like the recipes! The smoothies make for a great meal-substitute, and I think the Vega packets are only 3 points each on WW. Not too bad…! Wow!, Thanks Amyr for this Educative and Informative article that has revealed about blueberries having more antioxidants, I will engage more on how I take It. It has also thought me how to mix and arrange smoothies for my kids. I really love and appreciate this wonderful post of Yours. I give you all the credits Thanks. Wow! I love the look of these recipes! I have no children at home but they look like they will be delicious for me. Can’t wait to try!